At a middle school in Japan, a teacher spends the last day of school telling her students the story of why she is retiring. Earlier in the year, her young daughter was found dead in the school pool. In her talk with the class, Moriguchi-san explains that what everyone thought was an accident was anything but. It was murder... and the killers are in the class. So starts this novel of murder, revenge, and despair. For instead of going to the police, Moriguchi-san decides to be the one who brings vengeance upon those two students. Her actions and the aftermath impact not only the murderers but also their families and the other students. This was a very complex and interesting book. The way that it is written, from the point of view of several of the involved characters, really helps you learn about who these people are. It also shows you exactly how twisted people can be, and that revenge never works out the way you would expect. I received a ARC of Confessions through netgalley in exchange for an honest review. 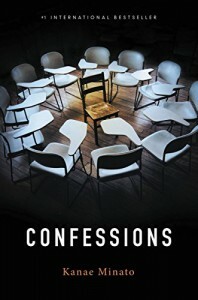 If you're interested in reading this book yourself, the kindle edition of Confessions is available at http://www.amazon.com/dp/B00H25FC72/?tag=shasworofboo-20. If you enjoyed my review, I would appreciate if you could mark it as being helpful on Amazon as well, as this is useful to both the reviewer and the author. I have included the link to the Amazon review in the Source section at the bottom of this review.